China is the largest national source of greenhouse gas (GHG) pollution causing climate change. However, despite some rhetorical progress at the 2011 Durban climate conference, it has consistently rejected calls to take on binding targets to reduce its GHG emissions. The Chinese Government has understandably argued that developed states are responsible for the predominant share of historical GHG emissions, have greater capacity to pay for the cost of mitigation, and indeed have an obligation to do so before China is required to take action. However, due to the explosive growth in its GHG emissions, China is now in a position to single-handedly dash any hope of climate stability if its position does not change. On the diplomatic level, other big polluters, particularly the United States, will not enter into new binding agreements to reduce substantially their own GHG emissions without a credible commitment from China. 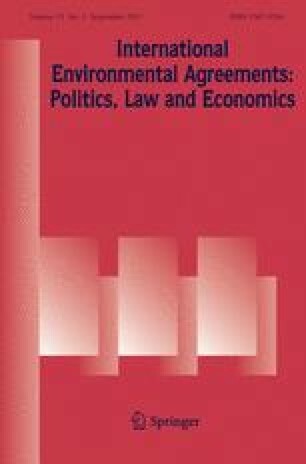 Challenging the “statist” framing of the climate justice, this article explores the possibility for China to take on a leadership role in climate change diplomacy in a way that allows it to maintain its long-standing principled resistance to binding national emissions targets while making meaningful progress toward combating the problem. Action by China’s rapidly growing affluent classes may hold the key to long-term climate stability. Research was fully supported by the Research Grants Council of the Hong Kong Special Administrative Region, China (General Research Fund Project No. HKIEd 340309, Principal Investigator: Paul G. Harris). Rasmus Karlsson gratefully acknowledges support from the Hankuk University of Foreign Studies Research Fund of 2012. British Petroleum. (2011). BP statistical review of world energy. www.bp.com/statisticalreview. China Climate Change Info-Net. (2008). Remarks at the Major Economies Meeting on Energy Security and Climate Change (President Hu Jintao). http://www.ccchina.gov.cn/en/NewsInfo.asp?NewsId=13471. Chinadialogue. (2010). China’s Interest must come first. http://www.chinadialogue.net/article/show/single/en/3792-China-s-interests-must-come-first. CO2 Scorecard Group. (2011). China. http://www.co2scorecard.org/countrydata/Index/4157. Gallup (2010) Americans’ global warming concerns continue to drop. http://www.gallup.com/poll/126560/americans-global-warming-concerns-continue-drop.aspx.